The Feminist Mystique and from two to one are co-hosting a series of blog posts about what people choose to do with their last names upon marriage. They ran my guest post on my decision today, and I'm really enjoying seeing the other perspectives on this topic. It's amazing how many ways people arrive at different decisions about what to do with their names, and it's also fascinating to see how differently people frame what's at stake. 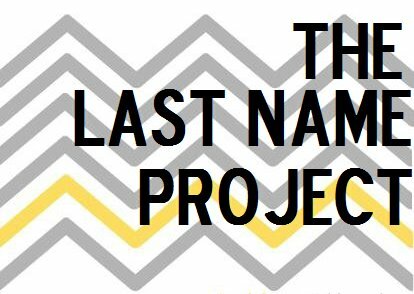 From not wanting to lose academic writing clout, to wanting to make sure children share their parents last names, to not wanting to offend in-laws, choosing a name is complicated business. It's totally a difficult thing, made more complicated when you add kids into the mix. My wife and I chose to keep our last names as they were, but add each other's last name as a second middle name. So we have a little bit of each other's names in our name somewhere, but our last names are as they were when we married. The solution my wife and I chose is a little complicated, but then we thought that our explanation of why we chose it was something we'd like to be telling our girls anyway, so it's okay by me that it's a little convoluted. And THEN it came to naming our girls. This is the part where our family thinks we're a little crazy, but that's okay by me. We gave child #1 my last name (and my wife's last name as a middle name) and child #2 has my wife's last name (and my last name as a middle name). These days, it's just not that uncommon for a child to have a different last name than their parent, or even their sibling. And we wanted to show that both of our family histories and names are worth preserving. But for us, the hyphenation was just not a good solution, as our last names are just too awkward-sounding when smushed together. We thought for a while about coming up with a new last name that combined both of ours into some kind of composite name, but it just seemed too contrived. So there you have it! Our way of preserving both names without hyphenating, and taking each other's names without altering our basic first and last names. Life is complicated sometimes! Thanks for posting, Balancing Jane! @Scott, if you are interested in participating in the series, feel free to contact me at danielle [at] fromtwotone [dot] com. That's a great way to do it! It maintains your pre-marriage selves but adds on a tie to the married self as well. I especially like what you say about thinking about explaining it to your kids as part of the motivation for doing it. Sure, it may seem complicated to other people looking in, but I'd be willing to bet that your kids don't really see it as complicated at all. I took my husband's name, because my maiden name is actually my father's last name. And my mother's maiden name is her father's...and so on back. Unless I make up my own last name, mine will always belong to a man. And I like my husband best of all the men in my life. That also makes a lot of sense. My mother used to use her maiden name as her middle name. It worked fine for her. She doesn't bother anymore. My wife was happy to take my last name, and I expected it. Like she expected me to be the one to drop a few thousand dollars on an engagement ring. It's curious that most of those who reject the tradition of the name change are happy to accept that tradition. I was given my father's name at birth, and changed my name to my husband's upon marriage. I never felt right about either name. My mother divorced my father due to his abuse, and we almost never saw him after that. I remember mentioning to my father about changing my so-called maiden name because I did not like it. Of course, he told me that was out of the question unless I got married, and then it was all right. Of course, I kept the stupid name until I got married. Unfortunately, my husband's name was even worse than my birth name, but I changed it anyway to avoid conflict. Long story short. I got a divorce and took back my father's name. However, over the years I've gotten much more feminist. I think that women are expected to and even browbeaten in some ways to take a husband's name or give that name to their children is just a form of patriarchal abuse. Women give birth and I really believe the children should have their mother's name. Yeah, I've heard the arguments that passing on the mother's name is just given them her own father's name. I don't buy that. After how many centuries of patrilineal names, we have to start somewhere. A metronymic is defined as being named after one's mother. It doesn't matter if it's one generation or a thousand. The minute I would give my children my birth surname, the name becomes a metronymic-plain and simple. That said, I never felt comfortable with my father's name because he was either abusive, or was never around. My mother is really the only parent I've ever really had. I recently decided to change my surname to my mother's maiden name. Wow! That really raised eyebrows because my original birth certificate name will be changed to my mother's maiden name. This is certainly not the case with a name change due to a marriage and/or divorce. My mother took back her maiden name years ago, and I actually feel so much happier that I can define myself by something other than another man's name. The name comes from my mother, and that makes it a metronymic. That said, the irony is that my mother's maiden name did not come to her through centuries of patrilineal name. Her grandfather was illegitimate, and the name came from a woman just a couple generations before my mother. I think that gives me the last laugh because there isn't an unbroken chain of centuries of patronymics in my mother's surname. Anyway, I don't plan on changing my name to please any future husbands, nor do I plan on giving any future children their father's last name (whether I'm remarried or not). I've had enough of the musical name game. "My wife was happy to take my last name, and I expected it. Like she expected me to be the one to drop a few thousand dollars on an engagement ring. It's curious that most of those who reject the tradition of the name change are happy to accept that tradition." Your talking about the tradition of the engagement ring signifying ownership of the bride started in ancient Rome. Guess what? There's an even older tradition called sadac (bridal gifts) where a husband would give his bride jewelry in what was known as sadica or beena marriage. In this type of marriage, the husband would go to live with his wife's people, and the wife would keep her own name. Their children would take the name and identity of their mother instead of their father. So, your argument falls flat because women keeping their own names could simply look on the engagement as reviving the ancient custom of sadac. In fact, the Roman custom of giving the bride a ring is really a patriarchal spin on an this older matrilineal custom. Originally, the patriarchal tradition was to give gifts or money to the BRIDE'S FATHER to purchase his wife. Now, unless you guys want to start buying engagement rings for your future father-in-laws, you can stop using the engagement ring as an argument to make women feel guilty if they want to keep their own names. We can just as easily say the engagement ring is reviving the ancient custom of sadac just as well as you can bring up the engagement ring as ownership papers tradition.